You'll be £12.99 closer to your next £10.00 credit when you purchase Tracing Your Ancestors Through Death Records - Second Edition. What's this? Of all family history sources, death records are frequently the most revealing since they often give a far greater insight into our ancestors' lives and personalities than those records created during their lifetime. Despite this, many researchers are unaware of the treasure trove of information they contain which can prove vital for fleshing out a family tree and locating yet further record sources. Celia Heritage leads readers through all the essential types of death records, showing how they can be found, read and interpreted. This second edition of her best-selling handbook is packed with useful information and helpful research advice. This revised edition of 2013's detailed guide looks at certificates, burial records, inscriptions, inquests, newspapers, wills and more, showing how there is always more for family historians to learn. 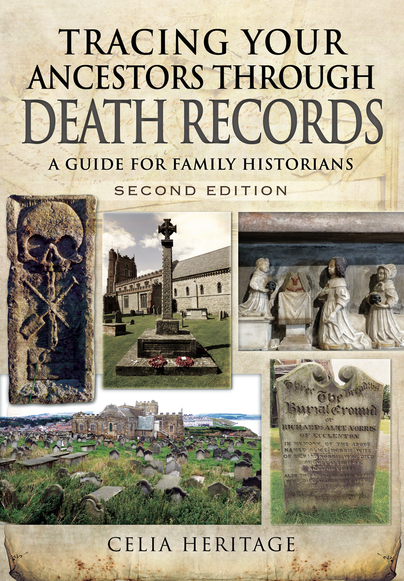 The second edition of this useful volume, in the ever-expanding Pen and Sword Family History series, brings together information on all the main types of death records available in the UK. Six chapters centre on death certificates, burial records, gravestones and memorials, inquest records, newspaper and magazines as sources, and wills. A seventh chapter deals briefly with more obscure sources such as funeral cards, photographs and hatchments. The book is well organised and many individual sections show how to use two sources together, or use them in conjunction with other sources, such as using wills and death certificates in tandem or with the Census. The explanations of using each section are clear and make it possible to formulate a research plan for a particular type of document. The author is always realistic and very well versed in likely reasons for confusion and error in the use of sources by beginners, as well as in resources that may still need explaining for the more experienced researcher. The book is illustrated with annotated photographs, many of which are from the author's own collection and also with case studies (presented in shaded boxes) which give examples from her own family history of the way to carry out different research approaches. The case studies are good and relevant, but my only comment is that for some readers the black font on the dark grey box shading will prove awkward to read. Occasionally, there are resource lists that almost by their very comprehensiveness lead one ironically to wish they were yet more complete. An example of this is the list of newspaper databases online on p114, detailing major sources for the four British nations and some additional ones in New Zealand and Australia but does not mention, for instance, sources such as the National Library of Congress free database Chronicling America, or other major US sources. However, these are small comments in the context of the book that is a major tool in the best use of death records and their relationship to other sources. There is a final short chapter which is an excellent attempt to get the reader thinking beyond the details in regular documents such as death certificates and burial registers; thus giving time to consider what effect the death in question had on a family. This could include events such as the death of a breadwinner causing relocation of a family, or the dispersion of children into other households, most often after a mother's death. Lastly, the book has an introductory hints and tips section, a bibliography classified by chapter subject matter, a fairly comprehensive index and a list of useful postal and email addresses. This is a book that should be commended for many researchers reaching the stage where they want to develop their initial research but would also have some considerable use for both relative beginners and experienced genealogists. Celia Heritage leads readers through all of the essential types of death records, showing how they can be found, read and interpreted. This second edition of her best-selling handbook is packed with useful information and helpful research advice. Packed with case studies, next steps and really useful problem-solving tips and tricks, this is a must-read for family history researchers who have reached all levels of experience. A valuable and comprehensive overview of an oft-neglected area of family history research. Family history has been Celia Heritage’s passion since she first began tracing her own family tree as a teenager. After studying at the Institute of Heraldic and Genealogical Studies, she gained a distinction in the Higher Certificate in Genealogy and now runs her own Kent-based company (www.heritagefamilyhistory.co.uk) providing family history research services and courses. She has recently adapted her popular beginners' evening class Building Your Family Tree into an e-course, making it available to students everywhere, and more advanced modules are currently being added. Celia also specializes in tracing living relatives and is often to be heard on BBC local radio.